Enjoy your rental's lanai after knocking it around at the Wailea Golf Club. Play on one of 11 courts at the Wailea Tennis Club, home to a 1,000 person stadium. Pick up meat and local veggies at the market for a poolside cookout. All you can hear is the satisfying click of a club driving the ball. The country-club style Wailea Grand Champions Villas is an eleven-acre resort located on the eighteen-hole Wailea Blue Golf Course. If you’re coming to Maui to play a few rounds, this is the resort for you. The only noises you’ll hear are tropical island birds and maybe the occasional “FOUR!” If tennis is more your style, you’re in luck. The Wailea Tennis Club is located right on-site. Or head back to your condo to get changed into swimsuits, grab pool toys and water wings, apply sunscreen and get ready to hit the two outdoor pools. Go for a swim or relax poolside with a refreshing beverage and the latest issue of People magazine. When the kids get hungry, fire up one of the four poolside bbq grills and have a family picnic. Let your little helpers carry hot dogs, burgers and sides. Then lay out condiments and toppings and let everyone go to town. Air-conditioned one- to two-bedroom condos sleep four to six guests and offer Garden, Golf Course or Partial Ocean Views. Three-bedroom condos sleep six guests and offer Garden views. Full kitchens have everything that you need to make everyone’s favorites. Surprise the kids and let them make their own pizzas for dinner. Don’t worry if things get crazy; you’ll have an in-suite washer/dryer for post-pizza cleanup. After everyone has finished eating, declare it family movie night thanks to the Cable TV with a DVD player. Bring favorite movies from home, gather everyone on the couch and get ready for a fun night in. 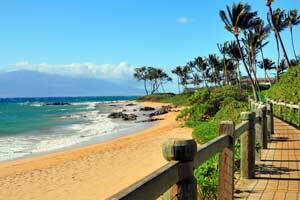 The resort is only a five-minute drive to Mōkapu Beach, a sandy beach that features some exposed beach rocks. If the ocean is calm, you can go for a swim or work on your sun-kissed look while the kids build a sandcastle. Treat yourself to some retail therapy at the Shops at Wailea where you will find both high end and affordable brands, jewelry, gifts and dining options. Luxury brands include Gucci, Louis Vuitton, Prada and Tori Richard. Get a new pair of shades at Sunglass Hut, apparel at Banana Republic, GAP or Tommy Bahama. Tiffany & Co, Na Hoku and Swarovski Crystal offer all the jewelry you could ever want. Get your caffeine fix at The Coffee Bean & Tea Leaf. Take advantage of Wailea Grand Champions Villas in-suite childcare and enjoy a grownups-only night out at Ruth’s Chris Steak House. Set aside a day for a family field trip to the Maui Ocean Center. Known as “the Aquarium of Hawaii,” it was named one of the Top 25 Best Aquariums in the United States by TripAdvisor. It features over sixty indoor and outdoor exhibits including a fifty-four-foot walk-through tunnel and the world’s largest collection of live Pacific Corals. HOUSEKEEPING Every Third Day Of Stay Deluxe Housekeeping Service Is Provided. - Guests that are planning to arrive after 9:00 PM must contact the property in advance using the information on the booking confirmation. Minimum Length of Stay: 2 nights. Holiday Minimum (12/22/2015 - 01/02/2016) 7-night minimum stay required during holiday periods.